I grew up in Louisiana. Well, most of my growing up life, anyway. Mardi Gras was a part of my life for those years. I don’t do Mardi Gras anymore (and that’s only party because I’m in New Mexico) all that much, but I like a good king cake. Lots. 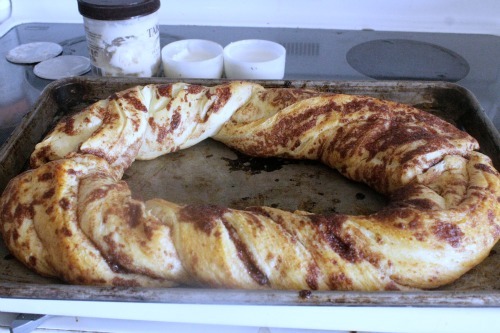 A couple of years ago, a high school friend posted this recipe for a king cake that was too easy not to try. And it worked. And it was yummy. 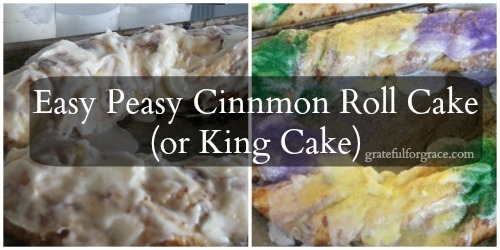 I am keeping it in the forefront of my mind not only for a king cake, but just for a yummy cinnamon roll cake. 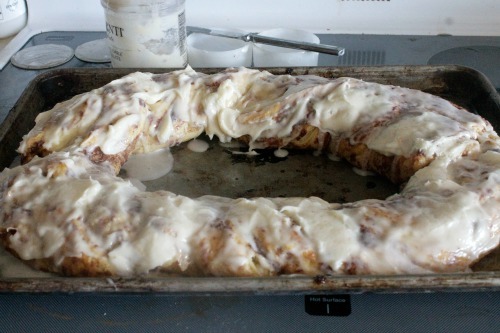 If you like cinnamon rolls, you’ll like this cake. 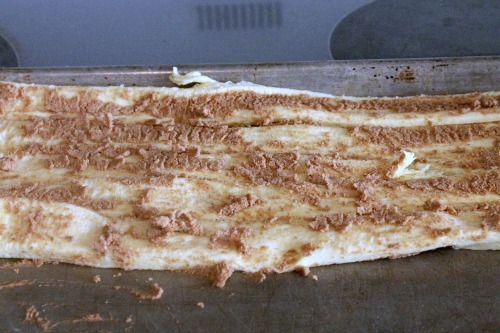 It’s wonderful for brunches or breakfast on special occasions. 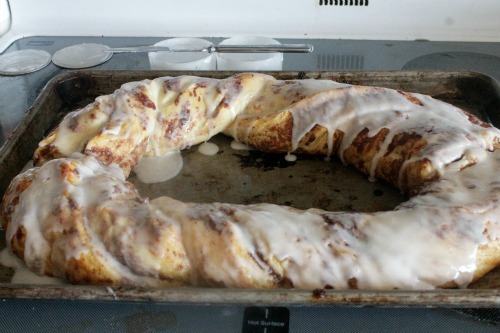 Such as Mom Wants Cinnamon Roll Cake Day. Enjoy! 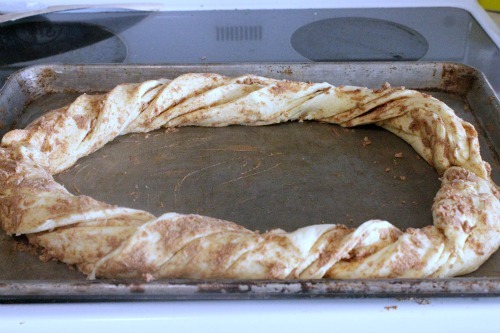 Open one can and unroll each cinnamon roll into 5 long strands. 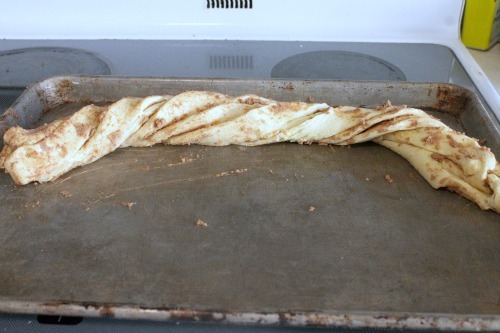 Mush them together into kind of a log, then twist it and lay on a cookie sheet in a half-circle shape. Repeat with the 2nd can. Join the ends with the first half to create a circle or oval. Bake at 350 for about 12 minutes (I think. I just kept watching it until it looked done). cream cheese cake icing because the two little ones just aren’t enough, in my opinion. 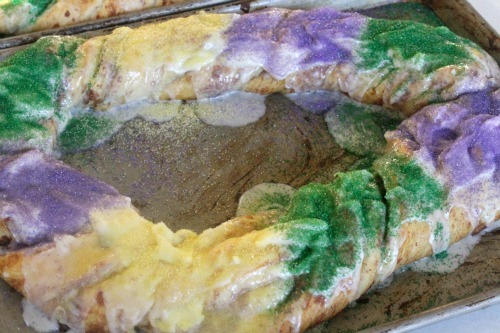 Do this while it’s hot, and sprinkle with the colored sugar right away while the icing is soft, if making a king cake. It’s worth a trip to Hobby Lobby or Michael’s to get the right colors of sugar because the grocery stores just have kind of pastel colors. I am not telling you to celebrate Mardi Gras or not to celebrate it. That’s between you and the Lord. I would say, if you celebrate then do all things in moderation. Drinking. Eating. Whatever. That’s biblical. Not Mindy-ical. I sacrificed for y’all by making each of these so I could post photos and taste the difference. Ahem. You’re welcome. So, who’s up for making one of these?